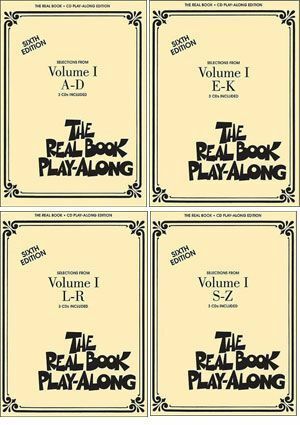 Hal Leonard is selling a CD set of backgrounds to ALL the songs in the Real Book Vol. 1. For about $100, you get 12 CDs of piano, bass and drums background that range in time from about 2 1/2 minutes to 6. Depends on the song. A couple of songs, like Wave, have guitar on them….sorta….it almost sounds like a synth patch. Or it was added as an afterthought. Some of the tracks could have been better with just guitar, bass and drums (like wave or Summer Samba). A couple of songs they took the piano out and replaced it with an electric keyboard type sound (like Sugar) which isn’t bad, but it isn’t as good as, say, a good B3 type of sound. Is it worth the $100? Yes. Originally I thought this would be sort of a lame package, or something that wouldn’t really add anything to the songs one might already have the Aebersold versions of. Or maybe that my favorite program, Band in a Box could do what this offers and more. The backgrounds on these discs are accurate playings of the songs found in the Real Book that Hal Leonard publishes (or if you still have the “illegal” version that used to float around until Hal Leonard picked it up). The guys on the discs will give you whats on the page. I suppose that Band in a Box could do that too with some work, but it still couldn’t capture the drum hits on songs like Some Skunk Funk. 9/10. It’s a little costly, some of the songs aren’t as long as I would have liked, and I wish there was more variety than 90% if the tracks being Piano, Bass and Drums, but it still offers a lot of songs (240 according to my iTunes playlist after I imported all of them) to practice with.